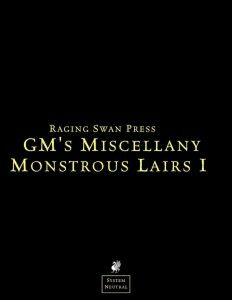 This compilation of the Monstrous Lair-series clocks in at 52 pages, 1 page front cover, 2 pages of advertisement, 1 page editorial, 1 page foreword, 1 page ToC and how to use the book, 1 page SRD, 1 page back cover, leaving us with 44 pages of content, so let’s take a look! At this point, I do believe that you’re familiar with the series – each entry includes 7 d10-tables, which feature approaches to the respective locale; the second table depicts what’s currently happening as the PCs stumble into the lair; we get two dressing tables – one for major, and one for minor features, and similarly, a table for sample valuables, and one for trinkets. Finally, there is a table that allows you to customize how the respective creature looks. As far as scope is concerned, this compilation organizes the following supplements in an alphabetic order: Aboleth’s sunken cavern, bandit camp, bugbear lair, dark creeper village, ghoul nest, giant spider web, gnoll camp, goblin raiding camp, harpy nest, kobold warren, lizardfolk village, medusa lair, minotaur den, mummy crypt, ogre cave, owlbear nest, pirate cove, sahuagin sunken cave, troll caves, witch hovels, thief hideouts and wight barrows. Now, I have written reviews for each and every one of these, so if you want my individual take on the constituent dressing files, please check out these; as far as I’m concerned, the main draw of this supplement would be its compilation nature. Editing and formatting are very good. Layout adheres to raging Swan Press’ elegant two-column b/w-standard, and the book features quite a nice array of b/w-artwork. The pdf version comes fully bookmarked for your convenience, and the file comes in two iterations – one optimized for the printer, and one for screen-use, which imho should btw. be industry-standard, but I digress. Creighton Broadhurst, Simon Butler, Jeff Gomez, Steve Hood and Mike Welham know how to write amazing dressing – at least most of the time. While a few of the constituent Monstrous Lair-installments fell slightly flat for me, the fact remains that the majority of the material within these pages represents a rather helpful tool for GMs. In particularly entries like the ones on gnolls, bandits or pirates, ones that should have had me yawn, actually managed to inspire, to elicit excitement, and the fact that this book compiles and presents the series in a format that’s more convenient to use at the table than an individual print-out/pdfs makes this worthwhile for folks like yours truly that already have a ton of printouts flying around the table. If you are primarily interested in a few of the files, you may want t consider cherry-picking, but otherwise, this does represent the best way to enjoy these lairs. My final verdict will clock in at 4.5 stars, rounded up due to in dubio pro reo. You can get this compilation here on OBS!